This calculator will forecast how much traffic you will need to meet your ad revenue goal -- as well as how long it will take -- all based on the online advertising revenue model. Plus, if you already have traffic and ad revenues, the calculator will even estimate the number of pages or posts your website or blog will need to achieve your goal based on your current revenue per page, and tell you how much each page might be worth over the course of the next ten years. Also, the calculator will accommodate planned sites, existing sites with no ads, and existing sites that are already generating advertising revenues. And finally, the calculator also includes a printer-friendly results page so you can print your traffic and revenue forecast. If you want to learn about the Online Advertising Revenue Model and discover an amazing tool that will help you to earn an income from it, be sure to visit the Learn tab before leaving. How I tripled my ad revenues. Calculate website traffic needed to achieve ad revenue goals, based on the online advertising revenue model. Select the time period you will be entering a goal amount for and then enter the associated amount (without dollar sign or commas). I recommend you simply enter an amount you would be happy with, versus entering some outrageous and unrealistic figure. Enter the monthly percentage by which you expect your website traffic to grow by, but without the percent sign. Note that newer sites tend to grow by a larger percentage (5-40%) and older sites tend to grow by a smaller percentage (.5 - 1%). In either case, be conservative. If you have no current traffic enter the number of visits you expect to get in the first month. The calculator needs this number to act as a primer for forecasting future traffic. If you have no current ad revenues you must choose either RPM or eCPM and estimate the associated inputs. If you have existing ad revenues you can skip this section (your existing revenue metrics will be used for the forecast). Enter the dollar amount you expect to earn from every 1,000 visits to your website or blog, without the dollar sign or commas. This figure can run anywhere from $1 to $30 or more, depending on your niche, but be as conservative as possible. Note that RPM typically stands for Revenue Per 1000 Pageviews, but this calculator bases its calculations on Revenue Per 1000 visits. If you choose to use this method of forecasting ad revenues, enter the CTR, CPM, and IPV. Again, be conservative. Enter the average dollar amount you expect to earn from each ad click, without the dollar sign or commas. Depending on your niche and the ad clicked, this can run anywhere between $0.01 to $15.00 or more. A conservative figure might be $0.10 (ten cents). Enter the click through percentage rate you expect from your ad impressions, without the percent sign. A conservative figure might be 2.5, meaning every 2.5 times an ad is viewed on your site a visitor clicks on it. Enter the expected number of ad impressions per visit. A conservative figure might be 1.5. If you have existing traffic to your blog or website, complete this section. Otherwise leave blank. Select the traffic period and enter the associated number of visits you are currently getting to your site. Enter the current number of web pages or blog posts. The calculator will use this figure to calculate how many pages/posts you might need to generate the traffic needed to achieve your revenue goal. If you have existing ad revenues, for each source enter the name (optional), select the period, and enter the amount. 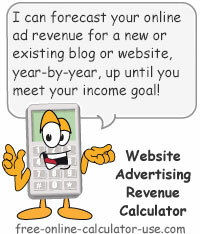 The calculator will use your current Revenue Per 1,000 visits to forecast your future ad revenues. Select the forecast start month and enter the start year, click the "Forecast Advertising Revenues" button, and then scroll down to view the results. Select the starting month and enter the 4-digit starting year. This section will estimate the number of visits your site will need to be getting in order to achieve your advertising revenue goal. This is either the entered RPM from above, or the RPM calculated from your eCPM entries. If you entered existing revenues this field will be blank as your actual RPM will be used instead. The is your entered goal revenue converted to other meaningful time frames. Based on the forecasted RPM, this is how many visitors you might need to achieve your goal per day, week, month, and year. If your site has no current traffic or ad revenue, this section will not apply. If your site has existing traffic but no existing advertising revenues, only the top portion of this section will apply. If your site has existing traffic and existing ad revenues, both portions of this section will apply. Whichever is the case, scroll down to view projected traffic growth chart. If you have existing traffic, this will either be the actual RPM or your forecasted RPM, whichever applies. If your site has no traffic this field will be blank. This your current traffic translated into per day, week, month, and year. This the average number of visits for each page you have on your site, translated into per day, week, month, and year. These figures will be used to estimate how many high quality content pages you might need to build to achieve your goal. If you entered revenues for source number 1 above, this is that amount translated to other meaningful reporting periods. If you entered revenues for source number 2 above, this is that amount translated to other meaningful reporting periods. If you entered revenues for source number 3 above, this is that amount translated to other meaningful reporting periods. If you entered revenues for source number 4 above, this is that amount translated to other meaningful reporting periods. This is the total of all existing revenues converted to other reporting periods. This is how much you are earning for each page you have built for your site, converted to each reporting period. Enter your ad revenue goal amount and select the period the amount is applicable to. Enter the percentage you expect your traffic to grow by each month. If you have no current traffic, enter the number of visits you expect for the first month. If you have no existing ad revenues, choose either RPM or eCPM method of estimating your niche's earning potential, and then complete the field(s) applicable to that method. If you have existing traffic to your site/blog, enter the current number of visits and the current number of pages/posts. If you have existing ad revenues, enter the name and periodic revenue for each source. Select the month and enter the 4-digit year you would like the forecast to start at. Tap the "Forecast Ad Revenues" button and scroll down to view and/or print the results. What the Online Ad Revenue Model is, how it works, and a powerful tool for making it work for you. I have been working full-time online from my home since 1997. I began as a self-taught web developer earning my living by creating interactive calculators for financial websites (you can read my story here). I enjoyed building calculators, but I had grown tired of having to build calculators based on customer specifications instead of based on my own creative self-expression. Luckily, in April of 2010 I happened across a company called SiteBuildIt! or SBI, whose website was extolling the virtues of becoming an Infopreneur. What a cool concept! While SBI teaches a host of different ways to make money from a website, the method that appealed to me most was the online advertising revenue model because it would free me to create my calculators based on my own creative self-expression, instead of based on the rigid and enslaving specifications of others. Thank goodness I decided to purchase the program. While I'm not comfortable with telling you how much my website is currently generating in ad revenues, I will tell you that I'm earning just as much as I was earning back when I was a restaurant owner. And what's significant about that is that I had to pay $350,000 to purchase the restaurant only to end up working 80 stress-filled hours per week -- which left no time for having a life outside of work. My website and traffic building program, on the other hand, costs me less than my monthly cable bill, and I am now totally free to work at what I want, with whom I want, when I want, and wherever I want. For the first 2-1/2 years, I was excited about the product I was using to create this website, but I didn't want to promote the product until I had proven the product worked like the company claimed it did. Well, that time arrived in September of 2012. After just 28 months of following their step-by-step system, the income from my website not only surpassed the amount I told myself I would be happy with ... but it just keeps growing! One of the things that convinced me to subscribe to their website and traffic building program is a page that displays a sampling of websites built with their product that rank in the top 1/2% of all websites on the planet. You see, after visiting many of the sites on the Top 0.5% list, I thought, if they can do it, so can I. Well, not only did I "do it", but my site is now listed on the very Results page that convinced me to give SBI a try in the first place (I'm listed under the FINANCE section). Is that cool, or what?! Basically, you place small bits of code from an advertising vendor (Google Adsense, Media.net, Infolinks, etc.) in various locations on your web pages or blog posts. In turn, the ad vendor delivers ads to each page based on the content of the page, thereby ensuring that the advertisers who are paying for the ads are reaching their target market. There are basically two general types of website ads. One type generates revenue when a visitor clicks on it (1 step), and another type that opens a page of links when clicked, which in turn makes you money if the visitor clicks on one of the listed links (2 steps, also referred to as "Link Units"). And as you might expect, the 1-step ads typically outperform the 2-step ads. How much do you earn when a visitor clicks on an ad or a link? Well, that depends on how much advertisers are willing to pay to get a click from your audience. You see, advertisers bid (how much they are willing to pay per click, called PPC) on keywords and key phrases that they feel would best attract their target audience. The amount they bid depends on the potential revenue their business can earn from the sale of their product. Obviously, an advertiser selling shoelaces is going to pay far less for a click that an advertiser selling luxury condominiums, so how much you make per click depends on what niche your website covers. Speculatively speaking, a shoelace ad might pay anywhere from $0.01 to $0.10 per click, where an ad for a luxury condominium ad might pay anywhere from $5 to $15 for the click. But guess what. If you build a site about shoelaces, don't expect to have the ad vendor send luxury condominium ads to your site. It's not going to happen. This explains why it is imperative that you fully research the income potential of your website ... before you decide what niche you are going to build it around. The absolute best tool I have ever found for doing website niche research is a tool called "BrainStormIt!" -- which is just one of the many invaluable tools that come with the site and traffic building program that SBI offers. In the advertising world, "conversion rate" is a common term used to describe how many people you have to expose your ad to in order to make one sale. For example, if you show your ad to 100 people and 1 person places an order, your ad would be generating 1% conversion rate (1/100 = .01 = 1%). In the online advertising revenue model, the conversion rate is known as the Click Through Rate (CTR), which refers to how many times an ad is viewed (number of impressions) before one of your visitors clicks on the ad. Depending on where the ad is displayed on a web page or blog post, the CTR can range from .0% to 3% or higher. So to see how much traffic you would need to achieve a certain ad revenue goal, you need to estimate the average CPC (the amount you earn per click), the average IPV (Impressions Per visitor), and the average CTR (Click Through Rate). Obviously, attracting over 66,000 visitors per day is an unlikely prospect for the average website owner, so again, you want to do your homework up front to ensure that you will be able to achieve your $100 per day goal with far less traffic. This is especially true when you consider that in order to net $100 per day, you can't spend any money to attract your visitors. What do I mean by "Free Traffic?" Free traffic, as the name suggests, is traffic that visits your site without you having to pay to advertise and/or promote your site. If you think about it, if you have to pay to advertise your site, then most of the money you make from selling ads on your site will be spent on advertising your site. That's why free (or organic) traffic is so critical to the online advertising revenue model. So how do visitors find your site if they're not finding out about you through paid advertisements? They find you through search engines (Google, Bing, Yahoo, Ask, etc. ), social media (Facebook, Twitter, LinkedIn, Pinterest, etc. ), and websites who link to your site for free because they think your content will provide value to their visitors. In other words, you must provide high quality content in order to attract free traffic. Choose the right niche: Don't build your site until research has uncovered a niche where there isn't an insurmountable competition, yet there is enough competition to attract advertisers willing to pay higher CPCs. Provide high-value content: You must build every page from the perspective that if you do it better than your competition, that page could be worth thousands of dollars in online ad revenues over the course of the next 10 years. Since first creating this calculator back in 2012, site ad revenues had grown steadily along with my traffic until 2014. However, starting in 2015, ad revenues started falling due to the rise of ad blockers and visits from mobile devices. Thankfully, back in March of 2016, I decided to turn my ad optimizations over to a company named Ezoic. Ezoic offers a product called, Ad Tester. Ad Tester uses a machine learning algorithm for optimizing the ad sizes and placements on a per-visitor basis. The results have been nothing short of amazing! As of this update (June 29, 2017), Ad Tester has not only tripled my ad revenues over June 2016, but June 2017's revenues set a new, all-time earnings record for a single month. Not bad, considering June is usually my lowest earning month of the year! More Money ... And More Time To Make More Money! What's super cool about the Ad Tester handling all of your ad optimizations, is that it allows you to focus all of your time on growing traffic to your site (more traffic = more income). No more having to split your time between trying to increase your ad revenues per visitor, and trying to grow your traffic! So if your site's primary monetization method is contextual ads, I highly recommend you give Ezoic a try. Disclaimer: After experiencing the dramatic turn-around of my ad revenues, it was a no-brainer to become an affiliate of Ezoic.